Well it’s 2012 and I’m already backtracking to the past. 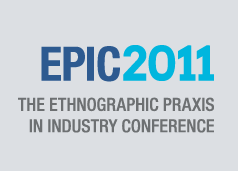 Back in September of last year I attended my first EPIC Conference (Ethnographic Praxis in Industry Conference) and never quite got around to writing up my thoughts on the week. The conference theme, “Evolution/Revolution: Change and Ethnographic Work,” got me thinking not only about the field of Ethnography outside of academia as a site of change and experimentation, but also as a site of growth and interdisciplinary collaboration. I was struck by the openness of this community to share themselves and their work with me and each other, and even more so by their willingness and availability to offer their thoughts, experiences, and suggestions to the community as challenges were presented and problems faced. I realize this is a strange moment of crystallization to be taken away from any conference, but I often am disheartened by the lack of cooperation and willingness to be of help to others even in my own academic institution. Frequently a topic of discussion, this collaborative divide in the social sciences extends beyond the office space to occupy a tension between industry and academia as larger entities. So in the spirit of evolution, revolution and new year’s resolution I encourage the continuation of this discussion back into offices and home departments in the hopes that the camaraderie I observed among colleagues at EPIC develops. Well – heeded Carolyn! And I appreaciate learning about Sam Ladner. Ironically, I was also recently blogging about academia and time-scales, but from the perspective of a student – noting that academia fosters “future thinking,” rather than “here-and-now” thinking.